International high-end cruiser company North Star Cruises combine adventure and luxury — which could mean handfeeding whale sharks in West Papua, exploring Aboriginal rock art in remote caves, or getting up close and personal under a waterfall in the Kimberley. The company’s flagship TRUE NORTH is a luxuriously fitted cruiser, which carries a maximum of 36 guests at a time, and is purpose-built for accessing shallow waters — it goes to places bigger ships can’t. And it has its own helicopter to spirit guests wherever they please. "On big ships, the focus is the ship, not the destination,” says general manager Peter Trembath. “True North is the complete opposite. Our focus is on getting people off the ship.” Guests have the option of designing their own agendas. “Everyone gets together at the bar at the end of the day to swap stories and tell the cruise director what they’d like to do the following day,” says Trembath. 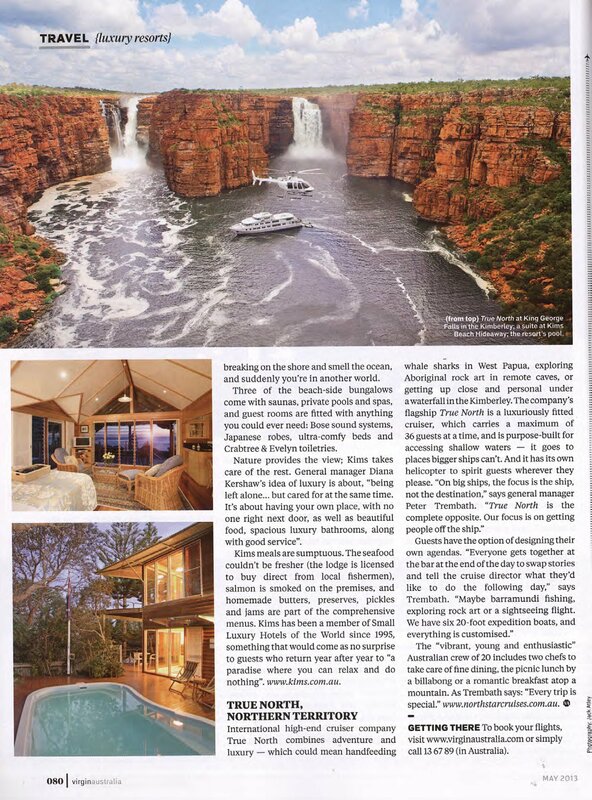 “Maybe barramundi fishing, exploring rock art or a sightseeing flight. We have six 20-foot expedition boats, and everything is customised." The "vibrant, young and enthusiastic" Australian crew of 20 includes two chefs to take care of fine dining, the picnic lunch by a billabong or a romantic breakfast atop a mountain. As Trembath says: "Every trip is special."